I don't know if I could honestly classify this one as a slasher movie, although Netflix does. Yeah, there's people, and yeah, they get slashed, but that doesn't make it a slasher flick anymore than having two characters in love makes it a romance flick. I'm on the fence with this one. It was a festival film, made independently, and I'll say that it's pretty good if you judge it against many of its peers. On the other hand, it just kind of feels like the filmmakers were trying to do something original, but haven't seen enough other movies to know when they're cribbing from somebody else, specifically Dark City and City of Angels, with a dash of Butterfly Effect thrown in. 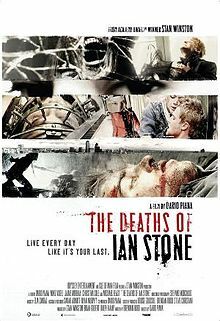 Ian Stone starts the movie as a college hockey player who makes an error that loses the big game when the game clock strangely stops a few seconds early. After showering and leaving the rink to drive his girlfriend home, he spots a body laying in the middle of the road and stops to investigate. It turns out that the body is not dead, and quickly turns the tables on Ian, killing him instead. The end. Psych! Ian jolts awake at his desk in the middle of a humdrum office. His girlfriend is there, but she's not his girlfriend anymore, she's his co-worker. Some changes to the initial scenario happen, but this same basic setup, beginning with him waking up and ending with him being violently killed, plays out several more times for the rest of the movie, until he finally figures out how to break the cycle. It wasn't a bad movie, and one sequence in particular, filmed in a hospital, was pretty well done. Even though it's already pretty short (just under 90 minutes), I think it could have worked better as a short film. If you've seen the movies I've referenced above, you'll figure out where this movie is going pretty quickly, and spend the rest of the viewing time just waiting for it to reach its conclusion. I've admitted in the past that I probably let my enjoyment of movies be influenced too much by whether I like the people onscreen, and that's a problem when one of the villains was played by Jaime Murray, who played Lila on Season Two of Dexter, and who was so irritating on that show that I thought her English accent was fake until I found out that she actually is from England. Don't let me talk you out of seeing this, but don't move it to the top of your list, either. I give it three melty clocks out of five.